I’m always appreciative of opportunities to try visiting chefs’ food. A couple weeks ago, on the occasion of the Lexus-sponsored Los Angeles Food & Wine‘s 70-event extravaganza, I had the chance to do so at one of the Friday afternoon not-so-power lunches held all over town (Though in the case of Chef “star power,” yes – it was very powerful). It was held at WP24 in conjuction with Executive Chef Sara Johannes, who contributed half of the 4 courses served at the sold-out lunch. With his title as one of the winningest Iron Chefs no doubt contributing to the buzz, Chef Morimoto and Chef Johannes sent out passed appetizers, a couple of which I never got to try. I’ll have to return to try out those seared foie gras bao buns and steamed XO scallops with hot oil, scallions & ginger – but the spoonfuls of Parmesan “Tofu” and Lobster & Scallop Shiu Mais were tasty enough as starters. The true standouts, though, were the four courses at the center of the lunch. Never had I had geoduck so tender and the snapper tasted nothing short of beautiful. 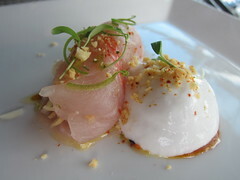 The papaya and coconut foam were perfect touches to the seafood. It was a refreshing start, and I couldn’t wait for more. 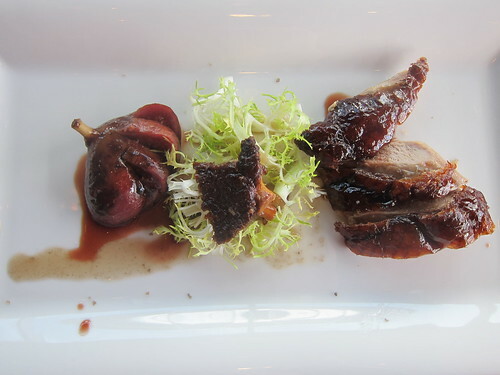 The next course that came up was Sara Johannes’ (and WP24’s) masterpiece – a Peking Style Duck Breast. It came with Warm Chantrelle Salad, the frisee of which tasted like roasted mushrooms, and Ten-Spiced Confit Figs and Smoked Duck Cracklin’. The cracklin was indeed a very nice touch, making a hyperbole of the importance of a crispy duck skin. 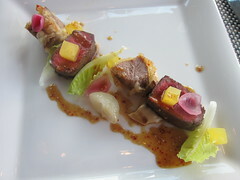 The figs really completed the platter, adding a tenderized, spice componentÂ to the perfectly-cooked richness of the duck. I have to say that this was probably the best dish I’ve had in a very long time. The Washugyu (a hybrid between Japanese Black Wagyu and fine American Black Angus) flat iron steak was incredibly delicious thanks to its beautiful marbling, but what really floored me was the tenderness of the veal cheeks within their slight, tempura breading. The veal cheeks were probably twice as tender as the already soft beef. The sweet soy was subtle enough to really enhance the flavors of the meat and let the cuts sing on their own. The dessert that concludedÂ our afternoon was no less impressive than any of the other courses, thanks to brand-new-to-WP24 pastry chef Cassie Ballard. Sure, you couldn’t really tell it was edamame ice cream until you read the menu (after that, it all clicks), but that sesame crisp is so simple yet ingenius. And tasty.Â Coupled with a Caramel Roasted Apple tart andÂ Butterscotch Miso, the dessert really comes together. It was lightÂ enough weight to elegantly close out the wonderful lunch yet left all our sweetÂ teethÂ satisfied (hello, caramel!). All food & wine were hosted.